Hiragumi (平組) means „flat band“ and refers to obijime with a flat profile. Hiragumi are by far the most common type of obijime. They are highly versatile in their use and can be used for different obi and kimono types, depending on their type. Especially the variations with two different sides are practical. Depending on the outfit, you can decide between what side to have visible. Hiragumi obijime have a width of about 6 to 15 millimeters. But there are also cords with a width of over 20 millimeters. 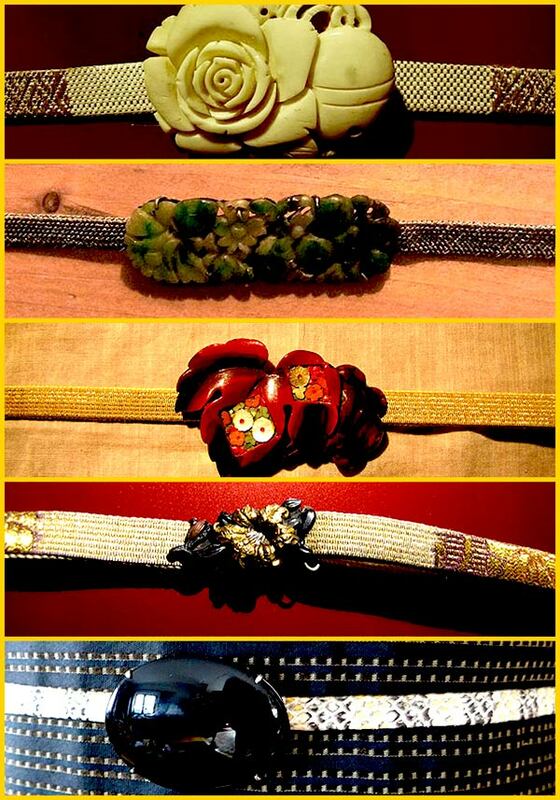 The slimmer cords are around 6-9 millimeters (nibuhimo, sanbuhimo) and are preferred to be worn with obidome (a decorative brooch). (Skip this part an go directly to sanbuhimo …). A common length for these obijime is about 150 cm. However, this measurement is based on the typical waist measurement of Japanese women. Due to this, the cords are often too short for people with a waist measurement of more than 80 cm. It is essential to have a certain minimum length for ones own measurements so the ends of the obijime can be properly tied and secured. Especially, because the ends of the obijime shouldn’t be too close to the knot. It is a general rule that the broader obijime is more formal than a slimmer model. Naturally, there is a maximum breadth for obijime. The broadest models that I have found, were just above 2 cm in width. With a breadth like this, more opulence can be shown and thusly emphasize the formality of the cord. However, these broader variations are also somewhat harder to tie. The basic gold and silver rule for kimono, obi, zôri and such also works for obijime. 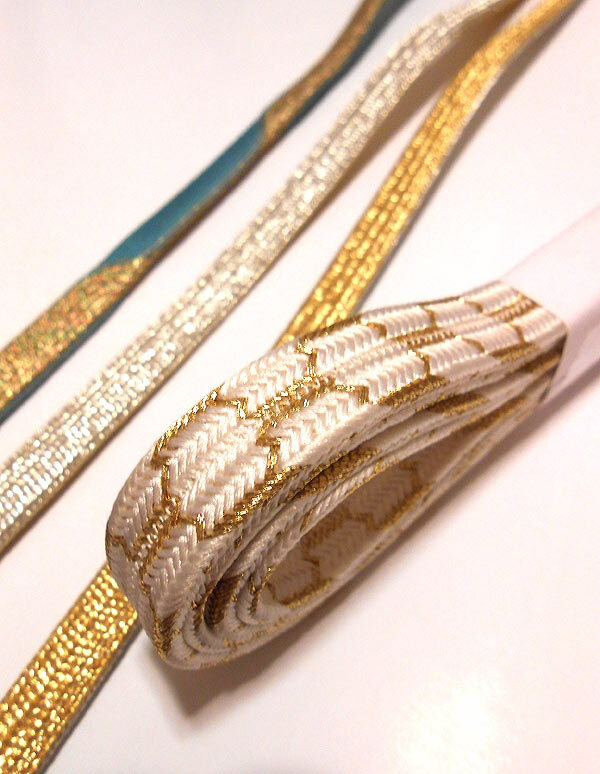 If there are golden or silver strands braided into an obijime it is on the more luxurious side and can thusly be worn with formal and semi-formal kimono. The more formal an occasion is, the higher the silver and gold content of a kimono-outfit should be. With obijime with a gold/silver side and a uniform coloured side, the side with gold/silver is the more formal side. The side without gold/silver can be used for semi-formal occasions, so in combination with a fukuro obi and a hômongi kimono for example. For every day and informal kimono in combination with a simpler obi, obijime with gold/silver are viewed as inappropriate by traditional Japanese standards, since the level of formality is just too different and thusly wouldn’t fit together. Flat obijime can be divided into different sub-categories, according to their shading and colour intensity for example. 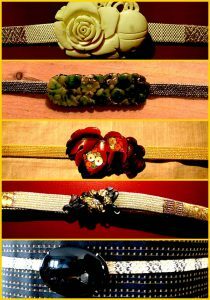 Or according to their braided motif that can consist of two or more colours. 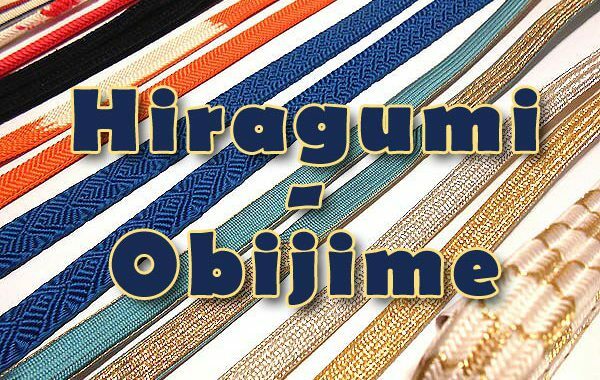 Hiragumi obijime are available in anything from a shrill colour to a gorgeous blend of colours as well as discreet to dark variations. In regards to what colour one should choose it is partially determined by the personal taste and in part by the age of the person of the wearer. Women of higher ages will tend more towards discreet colours, while younger women will drift towards more colourful choices, similar to how it is for kimono. 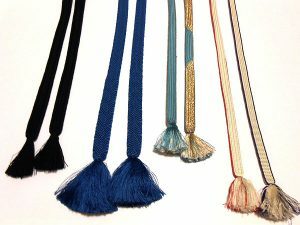 A simple, single-coloured hiragumi obijime is less formal than an obijime with multiple colours and different braiding patterns. 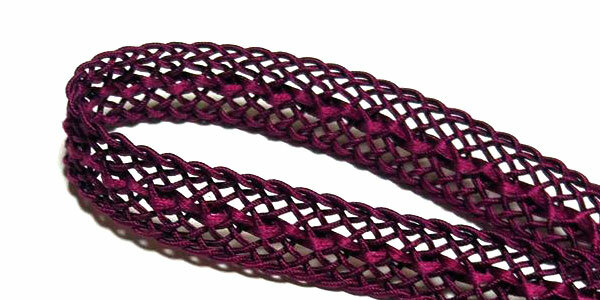 Some obijime braided with different braiding techniques can even be used on both sides: Here one side of the obijime is often less intricate than the other side. Thus, during the kitsuke adjustments can be made in regards to the formality of an outfit, just by using the respective other side of the obijime. In summer a slight breeze can be a great relief for any kimono wearer. That is why there are lightweight, loosely braided hiragumi obijime just for the warm season. The different strands of the obijime are clearly separated and resemble a coarsely made net. To prevent them from being too soft, especially stiff strands are used in this case. Due to this, obijime for summer are rather stiff and even somewhat hard, despite their loose braiding. Probably you’ll already know that kimono ensembles for mourning are completely black, even the obijime. With the white wedding kimono (shiromuku), a white obijime with gold accents is put on. The sanbuhimo (三部紐) is a 9 millimeters wide, simple obijime. It is used in combination with an obidome. The knot of the sanbuhimo is tied in front and then pushed to the back, where it is covered by the obi bow. 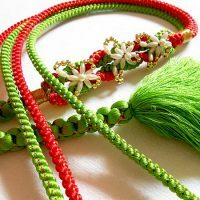 This special type of obijime usually doesn’t have any tassels, since they wouldn’t be seen when worn anyway. Before it is tied, an obidome is strung onto the cord, which is then worn on the front of the obi. There are however obidome that can be added after an obijime is already tied. The term “sanbu“ thus makes it possible to draw a direct conclusion to its thickness of 9 mm. Up until the second world war, even slimmer „nibuhimo“ (ni = 2) with an average width of about 6mm were used. They are however hardly ever seen today. Instead, it is becoming more common to see wider obijime decorated with an obidome. Soon, you’ll find more information on the other types of obijime, the „marugumi“ and „maruguke“, in the upcoming related articles. Stay tuned! Hier klicken für die deutsche Version dieses Artikels. Want to buy an obijime? 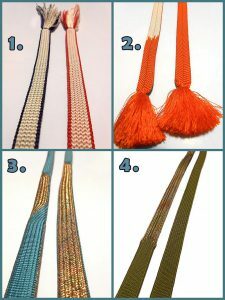 Posted in Kimono-Accessoires, Kimono-Zubehör, Obijime and tagged flat braid, Hiragumi-Obijime, obi binden, obi cord, obi string, obi tie, obijime, obikordel, sanbuhimo, sommer obijime, tie the obi, trauer obijime, さんぶひも, ひらぐみ, 三部紐, 帯締めの種類, 平組, 平組帯締め.